Ann Barnhardt tweets …”I’m sorry you made me hit you.” – What's Up With Francis-Church? To put it in your language. You’re one fine looking heifer. You’re way better looking than what’s her name. If it helps, I think you’re pretty. I never understood the Bacall thing. I may be wrong, but I think that’s the best comment I’ve ever read. Thank you for your reply. Wherein you posted in part: “This ain’t a dating website” For you unattached youngsters every website should be dating website. A good Catholic wife is a treasure beyond measure. “Besides, she’s too young for you” My wife also tells me that she (my wife) is too young for me. I guess I must look really, really old. “AB I mean, not LB (RIP)”. Ms. Bacall is, in fact probably a better age for me; but my young wife is stuck with me; and I am perfectly happy with the situation. However I still think that Ms. Barnhardt is a far more handsome woman than Ms. Bacall. Ann, you’re beautiful. Please don’t walk anything back on that account though, since to do so would only subtract from your ultimate charm. The Holy Ghost will always protect the Church. We have Christ’s word on that. We do not have Our Savior’s word that the Successor to Peter, His Vicar of Christ on Earth, the Possessor of the Keys to Heaven will be holy or smart or competent or even Catholic. Our present Holy Father, Francis, is without a doubt the Successor to Peter, the Vicar of Christ on Earth, the Possessor of the Keys to Heaven. How well he fulfills that role and answers that calling I will leave for my betters to judge. However far more important then a good Pope, to a young Catholic man at least, is a good Catholic woman. Good Catholic women are, proportionality speaking, rarer than good Popes. Now you young, unattached males follow me closely here. Nothing: no treasure,no glory, no job or promotion is better than a good Catholic woman. They should be courted, pursued and besieged relentlessly. I recommend the daily delivery of roses for two weeks. I know of what I speak. I have had the same Boss (a.k.a. wife) for over 30-years. She is quite wonderful and I do not deserve her and the nice thing is, being a good Catholic woman, once she married me the poor girl is not now stuck with me. What a great deal! “An excellent wife who can find? She is far more precious than jewels”-Proverbs 31:10-13. May all of you youngsters marry well. This ain’t a dating website, RWC. Besides, she’s too young for you. AB I mean, not LB (RIP). I will walk everything back, completely reverse my position and deny everything I know to be true if you will only, please, please, please tell me that you think I’m pretty. So, the pope is “apologizing” for unnamed scandals and adding to Scripture in order to make his point (which will no doubt become clear in time). As usual, he mangles and twists scripture. Here is Matthew 18:7: “Woe unto the world because of offenses! for it must needs be that offenses [temptations to sin] come; but woe to that man by whom the offence cometh!” And goodness, doncha know the context was our Lord talking about what would happen if one of his little ones were to be offended: “But whoso shall offend one of these little ones that believe in me, it were better for him that a millstone were hung about his neck and he were drowned in the depths of the sea.” (Matt. 18:6) Can’t make this stuff up. The pope is helping to engineer Catholic divorce and sodomitical acceptance, two things that will most certainly offend the Lord’s little ones. 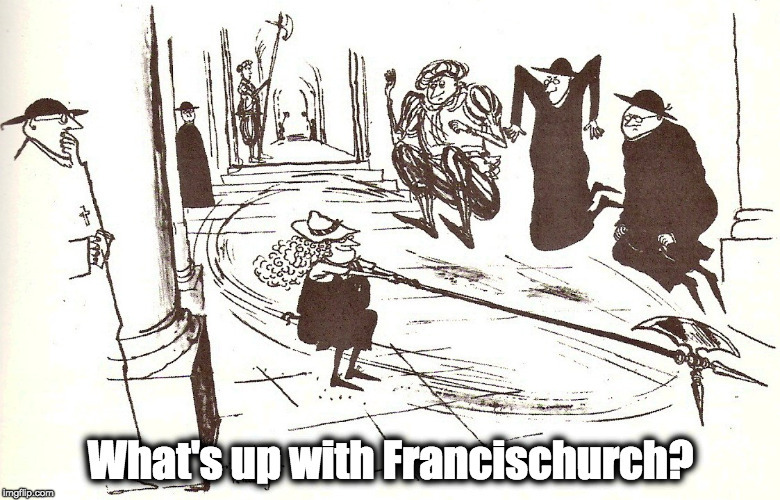 Unwitting prophesying about those who are innovating at the Synod? Not if she was referring to Bergoglio being drunk with power. If the shoe fits, John. I found it rather charitable of her. I agree. Ms. Barnhardt is a far more handsome woman than Ms. Bacall. Don’t be coy, Ms Barnhardt: he meant Danneels and Rosica entering the Eternal City arm in arm, metaphorically speaking. Can I say this and still be allowed to comment here? For you to refer to “Our drunken stepfather Bergoglio” is beyond the pale. If this comment is disallowed, so be it. And anyway, you don’t look like Lauren Bacall.